An extremely efficient optic system, a high IP RATE and endless possibilities of usage are the main features of the Studio Due CityBeam IP33 / IP54, a projector conceived with the same metal outlook as the CityColor although completely different in the optic. The sliding system of the optic, controlled by stepper motors, has been studied to have the lamp MSD 1200W generating a luminous beam cone with an opening angle varying from 15° to 20°. The Studio Due CityBeam IP33 / IP54 can cover a surface of about 130 m2 by keeping the lighting values higher than 300 lux over a distance of 50 mts. When using the cover without diffusion filter/flood (accessory available upon request) the angle opening can vary between 8° and 11°, covering a surface of about 150 m2 over a distance of 100 mts and with lighting values higher than 160 lux. The models that are presently in production differ in the electronics and IP RATE, 33 or 54, which make the CityBeam very suitable for outdoor use in bad weather conditions too. The model with highest IP RATE (cod. 0004) is equipped with a very intuitive control setting: special options are displayed on the menu, in order to show the hours that either the fixture and the lamp have been working for. The cooling system is controlled by a microprocessor, and together with the control circuits and the thermal switch guarantee a perfect working temperature and very little maintenance: often the only service to make is the lamp replacement only (after about 2.000 hrs). 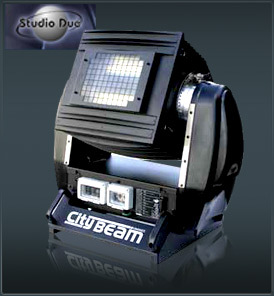 For particular needs, the use of the Studio Due CityBeam IP33 / IP54 can be combined to the CityColor, which is its ideal complementary: when working together these two fixtures can cover either big surfaces over medium and small distances, and also over greater distances with a narrow light beam. Fifteen programmes are already stored in the memory of the fixtures which can therefore be used also without remote controllers and in synchro mode with Master/Slave setting.